Original matte-finish, invisible tape will not dry out or yellow and pulls off the roll smoothly and cuts easily. Tape is invisible when applied and won't show on copies. Sturdy construction resists splitting and tearing. Easy-to-apply tape can be repositioned initially, yet secures permanently. Write on with pen, pencil or marker. 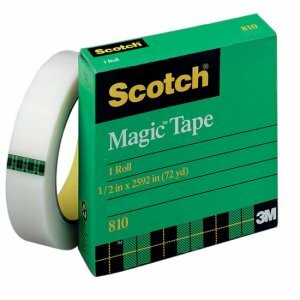 Photo-safe tape is great for mending, splicing and many other permanent applications.